By the end of this month, ten manufacturing businesses will close shop according to Manufacturers’ Association of Nigeria (MAN), while over 50,000 jobs have already being lost in Abuja, according to Chair of Abuja Chamber of Commerce (Punch, 24/02/2016), all due to inability to access forex for raw materials and business activities. In fact, in December 2015 when dollar sold for less than N260 at parallel market, non-oil export fell by 25% month-on-month and 75% year-on-year, mostly driven by fall in food and mineral export (ProShare, 16/02/2016). By the end of this quarter, there are expected mass layoffs across boards. The current economic crisis exemplified by the revenue fall and foreign exchange crisis, is a product of many years of neo-liberal and anti-developmental policies administered by agents of global finance capital, and massive looting of the nation’s wealth at all levels of governance and by all ruling parties. In the last 16 years of civil rule, Nigeria earned over $700 billion from crude oil exploitation; yet the level of development of the social infrastructures and economy is at abysmal level. Nigeria was plundered by politicians in power of all hues and coloration, and big business people (including their international partners and masters). Every year since 2005, less than 18, 000 political office holders at all levels and in all political parties cornered N1.3 trillion annually as emoluments. This is more than a tenth of annual national budgets of all tiers of government. That means in the last ten years, at least N13 trillion or $65 billion has been officially handed over to 18, 000 politicians (0.01 % of population). This is just official emoluments. According to a World Bank estimate some years back, about 20 kobo out of every N1 budgeted for any project is actually spent, while some estimates claimed that over $140 billion has been looted since emergence of civil rule in 1999. This is aside the looting under Jonathan government. On the other side, public wealth was used to ensure huge wealth and profits for big businesses. While waivers worth over N1.3 trillion was granted by the Jonathan government, the Obasanjo government before it also gave trillions of naira worth of waivers, tax breaks and monopoly to import for many big companies. This is aside billions doled out in form of government’s issuance of treasury bills and bonds, which guaranteed unmerited wealth for banks, financial institutions and big businesses (local and foreign), at the detriment of local and small businesses. In 2010, government used N2.5 trillion of public funds to bail out ten banks owned by a tiny clique of multibillionaires, while social infrastructures are in decrepit state. While public funds are given to politicians and big businesses, the same money, instead of being invested in productive and manufacturing activities, were again invested in government’s businesses that ensure huge profits e.g. privatization of state properties at rock-bottom prices, sale of oil blocks, inflated contracts and government’s borrowing. In situation where some productive activities were undertaken by big businesses like Dangote, Honeywell, etc., the government would have given several billion-dollar worth of waivers and dole outs to these private businesses. The state governments were not left out of this racket as politicians at state levels embarked on projects that were aimed at cornering public funds for private use, with little impact on economic and social development. The result is total depletion of public wealth. Excess crude account that was around $23 billion in 2012 was depleted to less than $2.5 billion by 2015, with little impact on the wellbeing of the majority of the population. Not satisfied with this, governments at all levels developed a strong appetite for debts. Under Jonathan, the 3 tiers of government shared over N29 trillion ($145 billion) (Guardian 21/06/2015), yet social and public infrastructures are still in parlous state while poverty and unemployment still thrive. At the same time, the country’s debt profile increased to over $66 billion (with foreign debt increasing to over $11 billion from less than $6 billion in 2011). While the Jonathan government mismanaged more than 52% of the N29 trillion that accrued to the country, the state governments run by all the major political parties also mismanaged over 40% of this revenue. There is little development of social and physical infrastructures to support productive economic activities. This implies that the country is permanently stuck to import-based economy, while exporting only raw materials like crude oil, which constitute over 80% of export earnings. For instance, the country spent billions of dollars on importing fuel and food items like rice. At a period of huge earnings from crude oil sale, this may not strike any danger, but with crude oil hovering around $30 per barrel, as against more than $80 two years ago, the naira is expected to continue to dwindle in value. Even if government uses external reserve to save the currency, it will not go far enough, unless there is a shrink in consumption or the country develops productive capacity. There is a huge wealth gap between the very rich and the poor. This means public wealth is concentrated in fewer hands, whose luxurious lifestyle, denominated mostly in hard currencies, put more pressure on the currency, which drive up cost of living for the majority poor, whose income hardly increase. At a point, Nigeria became the destination for all kinds of luxury goods including exotic wines, cars, jewelries, and aircrafts. In fact, the number of private jets was more than commercial aircrafts. Also, during the 2015 elections, the two main capitalist parties spent millions of dollars for “campaign”. In fact, dollar became unofficial legal tender of the rich. This coupled with collapse of public infrastructures and services, and fall in the income of workers, will means working and poor people spending their meagre money on fewer things, which drives up inflation and reduces purchasing power. Businesses are also affected leading to mass retrenchment or at best no new employment. While not all consumables and products are imported, the fact that many of the country’s daily needs including foodstuffs, drugs, raw materials, industrial additives, etc. are imported shows that other goods produced internally will share in the burden, as inflation is contagious. The pressure on naira also implies that there will be very little development of the country, as businesses that want to invest will scale back investment, while governments’ spending will shrink, leading to serious cut on purchasing power. For instance, the planned completion date of the oil refinery being built by Dangote has been shifted from 2018 to around 2020, while seeming permanent deflation of crude oil price poses threat to that business. The government has stated that it is not disposed to further devaluation of the naira which has been pegged at around N198 to a dollar. This would have been a welcome development if it was implemented. However, this sounds more like a doctrinaire and propagandist pronouncement than any serious economic policy. In the first instance, government banning of some goods, especially food items and industrial products, from using government’s hard currencies without serious programmes and policies to ensure production and availability of these products internally is more or less implementation of a neo-fascist monetary policy. It enforces compulsory suffering on the people, on the basis of maintaining the president’s rightwing nationalistic instinct. While government fixed naira-to-dollar at N198/dollar, it allows previous manipulation of forex by banks to continue while directing anger against parallel market, which was supposed to hold less than 20 percent of the forex market. Meanwhile, banks continue to aid currency devaluation through round-tripping (i.e. buying dollar at N198 from government but selling at parallel market prices). The government’s policy of withdrawing dollar support for BDC is wrong and counterproductive. It is a middle-of-the-road approach that can be more ruinous. If government wants to end the BDC business, it should have done so directly and organized a more pragmatic approach to retail sale of dollar to end users, at affordable or official cost. Withdrawing CBN’s dollar support to BDCs, while banks’ forex business is enmeshed in corruption, round-tripping and ineptitude has led to BDCs becoming a major market for end users and thus a major decider of naira value. Allowing BDC to operate on free market approach under the above scenario has led to disaster for the economy. Alternatively, government can continue to supply BDCs dollars, and directly monitor and control their activities and tailor them towards government activities. With this, government can reverse the laisser faire arrangement in the BDCs and banks’ forex activities. It is funny that government will fix foreign exchange at official market, but make dollar scarce at the parallel market where law of demand and supply applies. Meanwhile, the parallel market is more accessible and active than official market. To worsen already bad situation, the official forex market could not meet demand, even after government’s regulations. Furthermore, the government refused to release more hard currencies from external reserve to meet the fixed exchange rate and at the same time allows access to foreign currency. The summary of all this is that the government, while hiding under officialdom, has unofficially devalued the naira, and worse still deregulated the process of further devaluation of the currency. In order to make naira gain real value, and become a tool of development, government has to implement some immediate and long term fiscal policies as highlighted in paragraph 2(b) above. But the fiscal responses of government does not show any sign of providing any serious clue out of the ensuing crisis that may get worse in the coming period. Of course, the Buhari government claims to be planning about N2.3 billion spending on infrastructures and social programmes, but this seems more like piecemeal political project than serious economic revival project. Firstly, the over N6.05 trillion budget with a deficit of N2.2 trillion will be financed by N1.88 trillion debt from local and foreign borrowing, while the government will, at the same time, be spending N1.3 trillion to service existing debts (a significant part of which is for local lenders). This means government will be borrowing back the same money it pays to service existing debts, or better put, will be borrowing to pay debt. This is clearly not sustainable. Most part of the N1.8 trillion capital vote will be spent to fulfill existing contractual obligations on existing projects, while smaller amount is for new projects. More than this, the important aspect of the capital votes i.e. those for Ministries of Power, Housing and Works, and Transportation will gulp N660 billion out of the N1.88 trillion. With many contractors already indebted, the capital vote will only have marginal effect on purchasing power. The so-called special social interventions that will gulp some N560 billion (N300 billion and N260 in the capital and recurrent sectors respectively), is not tailored towards some serious or long term economic improvement. For instance, some of these social programmes like payment of N5, 000 benefits to 1 million poor people will be run on pilot scheme, and rely on support of credit and donor agencies, which will make such programmes limited in scope and elitist in nature. More than this, it does not provide holistic approach to improving export capacity of the country or long term economic development. Possibly, the school feeding programmes, mass employment of 500, 000 teachers and conditional grants to the most impoverished, will be the most impactful of these social programmes. If implemented, it will have some minimal impact in improving living standards of some Nigerians. However, this is too little to make needed impact to reverse the economic quagmire. 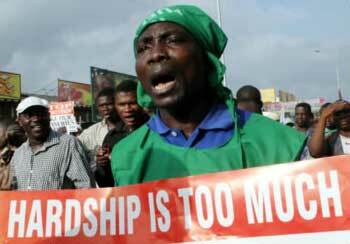 Over 3 million young Nigerians are reportedly thrown to the labour market yearly, while over 30 million people are jobless. Therefore, employing less than 500,000 young people over the tenure may not really address the problem. Worse still, the teaching jobs will only be a part-time job where beneficiaries are paid peanuts. This is similar to the Federal Teachers’ Scheme (FTS) of the Jonathan government which ended in fiasco as beneficiaries were unpaid for months. Furthermore, the social programmes will be carried out in conjunction with state governments. This is an assured failure, as most of the states are bankrupt and dysfunctional. Moreover, the ability of the government to meet the revenue collection in the budget is highly doubtful. Currently the crude oil price is below the $38 per barrel, envisaged in the budget, while the ability of the country to sell 2.2 million barrels per day is uncertain, as there is a glut in the crude oil market. Therefore, over N800 billion in revenue expected from sale of crude oil may be hard to meet. Of course, there is possibility that crude oil price may rise again, after reaching a trough; but aside the fact that it is doubtful whether it will reach $38, the question of quantity supplied is another issue. On the other hand, government’s plan to rake in over N3 trillion-worth revenue from non-oil sector and independent sources, as much as this will be welcome, is not premised on any serious economic plan. For instance, as a result of the government’s tumbling monetary and forex policies, the non-oil export has fallen significantly by 25% fourth quarter of 2015 and 75% year-on-year. Although, the decline is driven mainly by fall in food and mineral sales, while manufacturing and industrial exports grew. However, on the basis on growing inflation, high cost of dollar, inability to access forex market and falling purchasing power, non-oil sector export and possible revenue for government will seriously reduce in the coming period. Already, there are talks of possible mass layoff of workers before the end of this quarter. Government’s plan to raise N360 billion from anti-corruption is also doubtful based on the haphazard approach to anti-corruption campaign. It is our contention that government can recover trillions of naira from anti-corruption campaign, if the right and radical approaches are taken, as will be shown subsequently. Ironically, the 2016 budget itself is already tainted with corruption as several fraudulent allocations and votes have been and are being discovered from the budget. According to BudgIt, a budget tracking non-governmental organization, over N111.3 billion has been discovered as hidden and fraudulent allocations in the 2016 budget (www.yourbudgit.com). Also, as against the previous posture of the government, the 2016 budget and the burgeoning political population in the federal government, shows that there will be little change in term of reducing wasteful spending, even if more revenue is made. All of these government’s policies in the monetary and fiscal areas will do little to lift Nigeria out of economic quagmire it is, neither will it engender long-term development of the country. More than this, it is our contention that the new government had the ample opportunities to make significant improvement in the economic situation of the country within the last 6-7 months, which could have raised the productive capacity of the country, improve the purchasing power of the majority poor and reduce inequality. However, the government is still committed to pro-rich policies that have held the country down, while launching austerity for the working and poor people. Of course, some minimal structural changes like the implementation of Treasury Single Account (TSA), and removal of monopoly of some import licence by big businesses have been carried out. However, these are too little for any major positive change. In fact, these piecemeal and minimalist reforms have the capacity to create bigger problems that the previous ruinous policies of the Jonathan government. Neither moving forward nor moving back can be more disastrous than either of the two directions. Ample example is the Treasury Single Account (TSA) implementation. While government claim to be saving money through TSA and Zero Budgeting by centralizing revenue collection and disbursing expenditure centrally, the 2016 budget and all the crazy allocations and votes tend to encourage pilfering of public till. This shows the limitations of piecemeal reforms. Politicians, contractors and senior technocrats, while accepting TSA and Zero Budgeting found another route through bogus allocations to circumvent the policies and continue with the past. Without total and radical anti-corruption reform at all levels, no amount of piecemeal reforms can make serious change. Interestingly, it was the National Assembly, generally adjudged as the most wasteful of the government’s three arms that exposed the frauds in the 2016 budget. Even if government implements the TSA and Zero Budgeting, politicians and contractors will find limitations in the policies to sabotage any gain that can accrue from it. For instance, with the sluggishness and tardiness in policy implementation, TSA can be used to slow down government’s revenue collection effort, by ensuring that revenue generating agencies that draw their expenses from revenue they collect are starved of fund which will stunt their activities. Government should invest in social and public infrastructures in order to raise purchasing power. For instance, massive investment in education, healthcare, road, mass housing, etc. will lead to employment of millions, reduce cost of accessing social services (with government subsidizing social services) and by extension raise purchasing power. This will spur economic activities that can raise government revenue and reduce pressure on forex. Unfortunately, the much-touted ‘expansionary’ 2016 budget contains arguably the worst capital allocations to education, health and housing. For instance, according to president of Nigeria Medical Association (NMA), just 3.65% of the budget is for health as against expected 15%; while less than 10% of what teaching hospitals needed to operate is given to them (Punch, 20/02/2016). This means further commercialization of health, collapse of health facilities, inadequate medical staff and expected industrial crisis. According to university lecturers’ union, ASUU, “the total capital appropriation to each of the federal ministry of education headquarters and 19 federal secondary schools is more than the capital vote of the 39 federal universities, 24 polytechnics and 21 colleges of education” (Thisday 24/03/2016). The special fund for universities, agreed to by Jonathan government in 2013, which requires government spending N200 billion each year for the next 5 years, was not included in the 2016 supposedly ‘expansionary’ budget. It was only in 2014 that the agreement was implemented. Government should directly invest in mass production of exportable goods, and imported products that can be produced locally. For instance, specific agro-products can be mass produced locally by government. Also, imported food items like rice and fish can be mass produced locally. Government can directly invest in large scale farming and/or provide inputs (seedling, fertilizer, etc. ), machineries, market and extension services to farm cooperatives comprising mostly small farmers, under cost/profit sharing or equity arrangements. With this, forex will be saved, millions of direct jobs will be provided and economy boosted. Government should also renationalize privatized public assets like power companies and others that control the mainstay of the economy, as a way of planning a serious economic revival programmes for the country. All companies that have been involved in shortchanging the country and participated in looting of public funds should also be nationalized. There is no way the country can develop when her economic mainstay are in private hands, where the rule of profit maximization prevails. In the real sense, if government is serious about improving the economy, radical wealth redistribution will have to be carried out. This will mean government reversing the pro-rich policies of the past that had made the rich few richer. For instance, by introducing progressive tax such as property and luxury tax on the rich (especially in Abuja and Lagos, where federal government has tax coverage) and recovering withheld taxes by rich few, trillions of naira can be raised within a short time. There are so many unoccupied and underutilized properties and wealth across Abuja and Lagos from which government can raise hundreds of billions. The recent discovery of how a manager of Abuja Electricity Distribution Company earned over N36 million monthly to reduce tax on the company’s profit reveals how several billions of naira in taxes are being avoided by the rich. Businesses that cannot pay up their withheld or evaded tax should be taken over and in support of government’s economic programme. Government should also recover N1 trillion owed government through AMCON. According to AMCON MD, many of those owing government are living extravagantly. By taking over their wealth, properties and companies, government can get enough resources to save the economy. There is over N5 trillion in pension fund. If government take (or borrow) N2-3 trillion out of this fund to invest in its agro-allied programmes and social and public infrastructures, results in just six months will be seriously positive on the economy. For instance, government giving more than N500 billion to small farmers’ cooperatives, and small (productive) businesses at around 2% interest through BoI or BoA or under equity and cost/profit-sharing arrangement, will undercut the exorbitant and cut-throat interests from commercial banks, and seriously drive down cost of borrowing. If CBN could dole out N2.5 trillion in 2009 to ten banks owned by handful of multibillionaires, getting N2-3 trillion from pension fund to save the economy cannot be a problem. The current technical approach of CBN of reducing MPR and CRR by 2% and 5% respectively in order to encourage banks to lend to local businesses is a worn-out approach. The same government will be borrowing over N980 billion from local market to fund the budget, while also paying the same market over N1 trillion in debt servicing (a case of borrowing your money back). With this, banks and financial markets are assured of quick wealth; therefore, they can ‘sacrifice’ for now by holding back lending to ‘risky’ businesses in a depressed economy. Government can also recover hundreds of billions, if not trillions, from genuine anti-corruption campaign. For instance, instead of government’s politicized and piecemeal anti-corruption campaign under EFCC, genuine and holistic fund recovery can be undertaken. The trial of Senate President by Code of Conduct Bureau (CCB) and Code of Conduct Tribunal (CCT) shows that if government commits some focus on building capacity of CCB and CCT to prosecute corrupt public officers, trillions of looted money. By providing synergy with other agencies like EFCC, ICPC, Police SFU, customs, CBN and local banks, CCB and CCT can recover (and could have recovered) trillions within short time, and avoid unwarranted sensationalism currently associated with EFCC campaign. Many of the corrupt elements are public officers. This does not mean that EFCC activities are not necessary, but through integrated and holistic approach to anti-corruption that links all the agencies and aimed at ending all regimes of perfidy, we can recover more money within short time. But it seems the government is only interested in scoring political points against its equally corrupt PDP colleague, as any genuine anti-corruption campaign will expose the fraudulent basis of this government, which emergence was bankrolled by stolen funds from public till. All this shows the uniformity of all capitalist political groups in Nigeria. Only a radical government premised on revolutionary overhaul of the capitalist system, by mobilizing the working and poor people to the political and governance arena can make any tangible and long-term changes needed to move the country forward. It will be wishful thinking to believe that the current political structure comprising various elements who have played various role in the rot that has defined Nigeria will make any serious change to the political economy of the country. The labour movement should wake up from its slumber and demand a radical reforms that will liberate the working and poor people. All austerity programmes should be rejected by labour movement. Ultimately, labour movement should build a mass working political party that can provide alternative social, economic and political programmes premised on socialist ideas, to the capitalist agenda of all the ruling political parties in Nigeria. Conclusively, the current economic impasse in Nigeria reflects the crisis and fundamental failure of global capitalist economy. Since 2008, the world has not gotten out of economic maelstrom that has led to frailty of global economy. China and other big economies have not recovered from pre-2008 production. This is background to Nigeria’s economic crisis which is tied as a latecomer to the apron string of global capitalism, which is premised on obscene inequality not only among nations, but also between the richest 67 people (who owns more than half of world poorest) and the majority working and poor people. Therefore, the permanent solution to global misery lies not only with working people of Nigeria and Africa, but of the world, by ending the rule of capital and established a democratic socialist order.